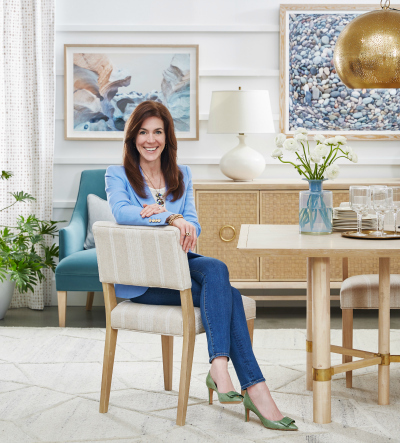 WINNIPEG – Full-line furniture resource Palliser will launch a new collection of both case goods and upholstery at the upcoming spring edition of the High Point Market created in collaboration with Canadian designer and television personality Sarah Richardson. It’s the company’s first-ever collaboration with a celebrity designer. The spring edition of the market kicks off its usual five-day run on 06 April. In a statement, the company said the collaboration will combine the accessibility and elegance that make up Richardson’s signature aesthetic with Palliser’s quality and craftsmanship. Sarah Richardson for Palliser is comprised of four themed collections – each includes dining, bedroom and occasional pieces alongside made-to-order upholstery in a wide selection of fabrics and leathers curated by Richardson. A true turn-key solution, each collection is designed to fit together seamlessly and includes a broad range of decorative rugs, throws and accent pillows that unite to create her signature style in any room. Annex, a collection designed for the modern family, showcases natural wood tones, ash burl, and vintage-inspired details. The sophisticated Boulevard gives a nod to art deco with rich walnut and indigo accents that will resonate with the urban dweller. Shore is quintessentially Richardson – light, bright, and full of feminine elegance, its handwoven rattan, linen-cast resin and brass details evoke coastal living. For city living, Vista takes a bold approach to luxury with crisp geometric veneer patterning, contemporary hardware, a palette of fog and oyster wood finishes and deep splashes of red and tangerine. Sarah Richardson for Palliser is the company’s first partnership with an outside designer and signifies a new chapter for family-owned and operated furniture resource. Tielman said the line showcases Palliser’s diverse capabilities and presents a fresh take on the company’s core strengths, such as motion furniture, leather and wood case pieces. Believed to be Canada’s largest furniture manufacturer, Palliser will continue to design and produce case goods and made-to-order upholstered pieces for its current retail customers. Sarah Richardson is the host and co-producer of eight HGTV lifestyle series which are seen in over 100 countries. She is also principal of the Toronto-based Sarah Richardson Design and a brand ambassador for Monogram appliances and Marcelle Cosmetics. She is also the author of two bestselling books for Simon & Schuster, Sarah Style and At Home: Sarah Style. The Sarah Richardson for Palliser collection will be ready for shipping to retailer beginning in September. It will also have its own web presence at sarahrichardson.palliser.com. Richardson will be present in Palliser’s showroom – located on the top floor of 220 Elm – from 04 to 08 April.